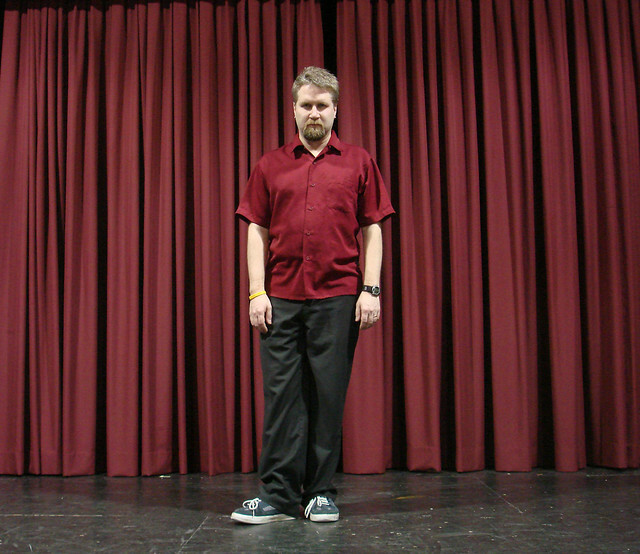 Me in my usual show shirt, looking extra hilarious in 2008. About a hundred years ago (well, around ten) I was occasionally working with a corporate comedy group called Chicago Comedy Company founded by old friends Andy Eninger and Steve Matuszak and when they opened a theater in the suburbs, of the same name, I sometimes performed there as well. Five years ago, another good friend, Lillie Frances, bought the company and theater and I started performing more often. The name of the theater was changed to Laugh Out Loud (which frankly makes a little more sense for a place in the suburbs, though it is still true that most of the performers drive out from Chicago). I stopped performing at the theater back in 2010, but this weekend is the 5th Anniversary and the theater is celebrating with a weekend of Alumni shows. I’ll be performing in the Friday, 7:30 “family-friendly” show. Tickets are just $5.